Essentially, the whole reason for this post is the second half of the title – the spicy peanut sauce. I was looking for a good recipe for Thai peanut sauce and was willing to put it on pretty much anything, so it’s lucky that this dish actually turned out well. I found the recipe on the aptly named site The Recipe, started by North Carolina’s News & Observer, which nearly always has excellent recipes and photos. 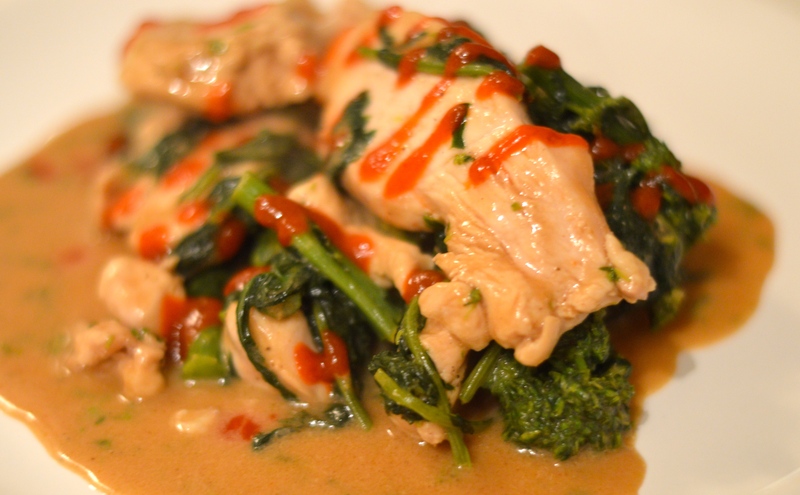 Broccoli rabe, aka rapini, may be a little bitter for some people, but the peanut sauce has a sweet element that balances the dish. If you’re still nervous about the broccoli rabe, just use broccolini or regular broccoli, as in the original recipe. Unfortunately, I didn’t get any photos of the making of the peanut sauce because mixing peanut butter with soy sauce looks kind of gross. But, the end product is awesome – savory, nutty, a little sweet and excellent for basically anything you want to stir fry, toss with noodles or mix in with rice. In a medium-sized bowl, whisk together the brown sugar, peanut butter, sesame oil, soy sauce, sriracha, vinegar, warm water and lime juice. In a large skillet over medium-high heat, add the vegetable oil and once it’s hot, add the broccoli rabe. Saute until wilted, less than 5 minutes. Slice chicken breasts into half-inch strips, across the grain of the meat. Sprinkle with salt and pepper, then add to the hot skillet with the broccoli rabe. Set aside a 1/4 cup of peanut sauce, then add the rest to the skillet. Cook, stirring often, for 10-15 minutes, until chicken is cooked through and the sauce has darkened in color. Serve with a drizzle of sriracha and extra peanut sauce over rice or noodles.